The data recorded via the mobile terminal and the AFoRS-Application, with the aid of a simple recording of images and all material additional information are possible to made. By AFoRS-application frontal frames of stacked timber are captured and provided with metadata then send to the AFoRS-Serverb for calculation. 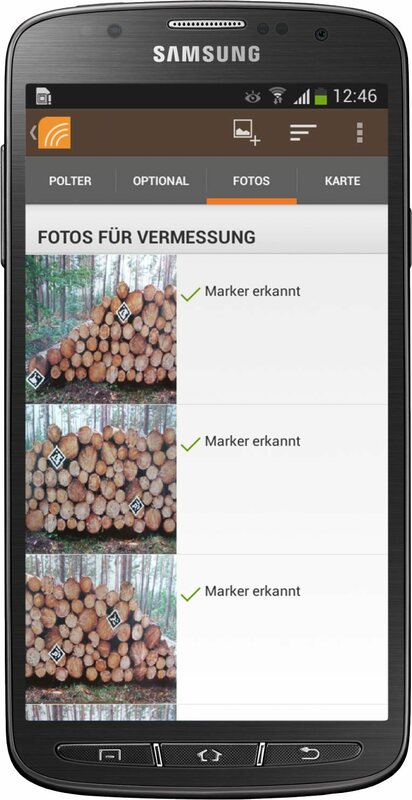 To ensure the inclusion of adequate image data supported tools are integrated in the AFoRS-App, ensuring a fully owned processing of recorded the images of the wood stacked. In addition, The information about the date, time, position and identification are fully automatically gathered from the libraries of the recorded images and added to your record. The core of the AFoRS image processing server is a 12 stage image processing framework, the AFoRS-BV-Pipeline, which was developed in collaboration with the Fraunhofer Institute for Computer Graphics Research IGD and is responsible for the fully automated measurement of the pile with room dimensions, fixed dimension root number and strength class distribution. The collected data are available on the AFoRS Web Platform to manage, edit and forward. The image processing is decoupled and independent in itself. The so-called AFoRS-BV-Pipeline operates asynchronously from incoming stacked wood data and provides the calculated results ready. Incoming data are frontal images taken timber and metadata like stacked wood depth, conversion factors and deductions. In a multistage process, the individual images are first pre-processed, their quality checked and with a novel method, the respective wooded land segmented. The images are corrected, visually, and prospectively, the timber wrapping is calculated and each tribe is separated. The number and the master class distribution arise from a process which separates the individual tree trunks in the binary image and determines the radii. For internal processing of the individual images, the images are composed and determined corresponding overlapping areas. The net result of space and cubic meters, the strength class distribution and the number of strains are available to the user. Thus, the processing chain is transparent, the composite wood stacked timer and data provided segmented images in addition. Secure interfaces and the direct transmission of data (via UMTS, HSDPA (+), LTE and WLAN) on the AFoRS servers allow quick access and dynamic structuring, management, processing and presentation of stacked wood information. Integrated GIS tools also allow the administration and coordination of timber resources in the forest. External interfaces to customers or process partners as well as other online services (for example, transport exchanges) allow an optimized data exchange. The evaluation of the system usability is being completed. Field trials have already been carried out, at which several mobiles have been extensively tested. Some of the evaluation criteria are the camera optics, manageability at forest locations and data transfer. Initial positive results have been registered with regard to the menu navigation in the application. The accuracy of the AFoRS-BV-Pipeline results has already been evaluated by different methods. Individual modules have been tested on the basis of manually segmented image data. The results of the complete pipeline have been confronted with data emerging from other survey methods. The comparison shows a mean deviation of less than a 5%.